when you think of the desert, you think of a flat, dry landscape. at least that's what i thought of. then i moved here, and it is definitely dry and flat, but it also has more mountains and hills than i ever could have imagined. and they are surprisingly beautiful. they are covered with saguaros and super rocky, but they have this quiet beauty that comes from being created millions of years ago. they told us that the trail was about 1.5 miles and paved. awesome. we figured we'll do a quick little walk about this hill and then go grill out and enjoy the sunshine. we did not realize that we had 1.5 miles to go up 1000 feet in elevation. it was a steep climb. a really steep climb. 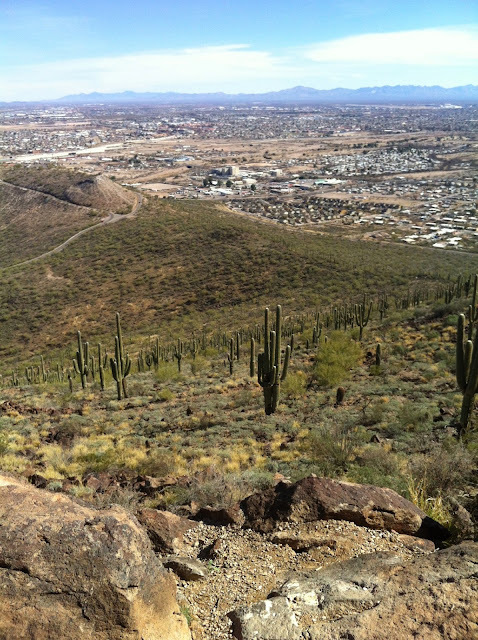 but the views of tucson were amazing. the trail is easily accessible from the parking lot behind st. mary's hospital, which is located in the eastern part of downtown tucson at silverbell road and st. mary's road.